Databases are from the past! Search is the future! Over 75% of the US population uses the internet nowadays. Mostly to find stuff. That information does not reside in databases, but in indices. Bing, Google, Yahoo, etc. all use indices to find the information relevant to you, fast. So…why are you still using databases in your back office? We at Cliffhanger are applying the same technology that Google, Facebook & Microsoft use, to find, rank and serve you with the information you are looking for. However, we have gone a few steps further than that. We store your NEWLY captured information (think about [field] inspection information, damage assessment information, vegetation management data, etc) in the same search index. Now, you may think ‘so what’? How does is that going to help my organization? The answer embodies an entirely new way of thinking: find what you are looking for fast, without the hassle and lots of button clicks. Example: when you are looking to find the MSRP of the new F250 you have your eyes on, you don’t specify that you are looking for a ‘vehicle’ of ‘brand name Ford’ and ‘model F250′ and that you want to know its MSRP. You just Google “F250 MSRP”, right? Atlas works the same. 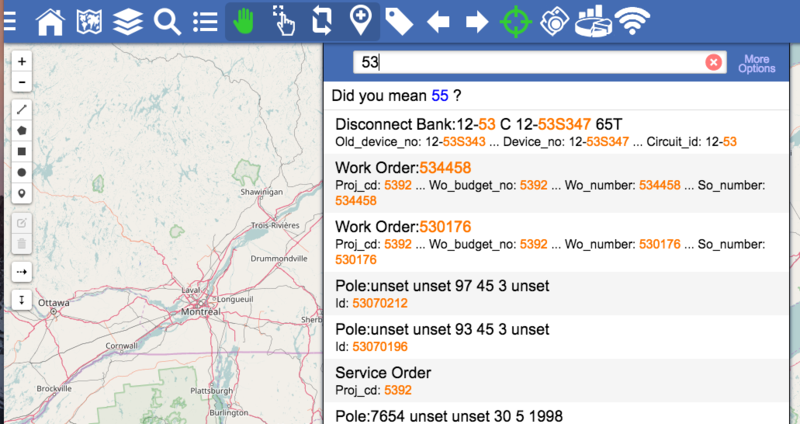 If you want to find an asset, you just type in ’19609′ and Atlas shows a list of Poles with that ID, Addresses with that house number or work orders from the past. And yes, we apply a ranking to the results as well. You don’t need to specify which fields need an index because there is no database. By default, all ‘fields’ are searchable. Now, imagine you are doing an [pole] inspection by taking photos of the pole, write a few brief comments (either by typing or using your voice) that this pole needs to be replaced. Now, you go to the search window and enter ‘pole replacement’: it finds this pole because you have the comments associated with the picture you just took. Or you enter ’19609 photo’ and the results come back with the photo of that pole. How easy is that? Imagine the amount of time and money saved using this principle for the end user. But the real power is the low cost of operation because there is almost no maintenance. There are no schemas to maintain. Scaling a cluster both horizontally or vertically is trivial. There is no middleware. Performance and high availability are core features. This is just a simple example of how we use modern technology to streamline your operations and make software more user-friendly. We apply this principle to ALL your data. Whether it comes from Intergraph, Smallworld, ESRI, SAP or Maximo: we don’t care, just search it! We at Cliffhanger are engineers, enjoy technology and are always thinking ‘innovation.’ Give us a call to discuss how we are disrupting the utility market with our innovative technology and how that can help your organization!